Female hair loss is much more common than often thought, affecting over 8 million women in the UK alone. Our hair is our crowning glory, being associated with femininity, youth and health, so it’s no surprise that when women lose their hair, it can cause a substantial psychological effect; creating low self esteem and sometimes being the cause of depression. There are a number of causes for female hair loss, including alopecia, hormones, stress and some medical conditions such as hypothyroidism, due to this, it’s always a good idea to visit your GP if you think you may be suffering from hair loss. A majority of the women face hair loss and hair thinning during some point of their life due to various factors like diet, medication, stress, genes, hormones deficiency etc. While hair loss is not the end of the world, hair is part of the beauty regime making up for her personality and charm. Hair loss and hair thinning can sometimes create lack of confidence and difficulty while living in a social community. For these reasons, Hair transplant is a life-saver, a surgical technique for hair loss treatment where individual hair follicles from a hairy area or donor site is transplanted onto a bald or barren area on any part of the body. Hair transplants are permanent and prevent future hair loss; hair grows 4-6 months after the transplantation but normally varies from individual to individual. Follicular Unit Extraction is a type of hair transplant where individual hair follicle from the nape of the neck is transplanted onto a bald or barren area. 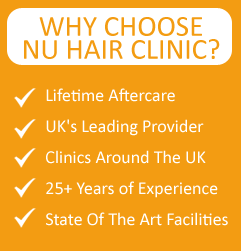 The technique is relatively new and performed only by a few expert surgeons at the Nu Hair Clinic in UK. The whole process is quite labour intensive and time consuming as it depends on the density of the hair and the treatment area. Another popular and in-demand hair transplantation procedure is Follicular Unit Strip, where strips of hair are removed from the back or sides of the head and then transplanted onto the desired area in the body. 1-3 units of hair follicles are removed by surgeons and then implanted into the area of thinning and baldness. Soon after the hair transplantation, your scalp may be a little sore for which you will be required to take antibiotics and other medications to reduce any inflammation or infection. You may resume work soon after the surgery and it is normal for the transplanted hair to fall out after two or three weeks making way for new hair growth in a span of 9-12 months. Rogaine or Propecia is prescribed by doctors to improve hair re-growth and stop future hair loss. After the transplant, hair has to be taken care of to maintain its beauty and lustre. Any strenuous activity must be avoided for two weeks soon after the procedure, and all the instructions advised by the doctors must be strictly followed to have beautiful hair for a longer time. Hair can be gently washed soon after the treatment with the given medication as per doctor’s instructions. Our surgeons are all experienced and trained to conduct these hair loss treatments with precision focusing on every single detail. A perfect team of professionals look into your hair loss problem and after thorough diagnosis and investigation prescribe to you the required treatment that will be carried out in an efficient and hassle free manner to make the patients at ease and deliver the desired results. All our female clients are very happy with their results and often come back to us for tips and instructions to effectively manage their hair. Many women feel most confident now that before, after the surgery and recommend Nu Hair Clinic to their fellow colleagues and friends as well. Hair is an integral part of women’s body and effectively managing hair fall helps to alleviate the problem and bring happiness in life. The prices for hair loss treatments are comparatively low and affordable across all Nu Hair Clinics in UK, but they differ according to different treatments, the surgical and non-surgical treatments have a different pricing like so. Do you wish to have a hair loss treatment but are you running short of money? Worry not as Nu Hair Clinic offers you the monetary benefits to conduct your treatment without any hassle. You can restore the treatment money in different instalments, for further information kindly contact the reception at Nu Hair Clinic.